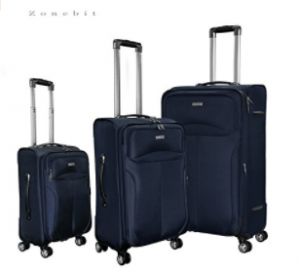 Zonebit STIG16-001 is a three-piece luggage set that includes the upright soft-shell suitcases of 20, 24 and 28-inch sizes with 360-degree rotating spinner wheels. You have three color options of black, grey and navy without any price differences on the day of this review. These three bags are sold as a set and you can’t purchase them separately. This is an imported set but is normally stocked in the US and the shipping is fast as long as the unit is not out of stock. If you order the product when it shows temporarily out of stock on Amazon product page, they will inform you when it is in stock via email and you will be charged when the set is shipped to you. Please note that the three suitcases will be sent fitted to each other with smallest into the medium and the medium into the largest suitcase. And the packaging will show what’s in it and if you don’t want this, you need to select “Conceal Package” during the checkout on Amazon.com. The material used is the 600 denier polyester which is both quite sturdy and lightweight. It helps make the suitcases be more resistant to scratches and impact as well as protecting from rain or water. All the three bags come with the solid chrome internal retractable and locking push button handles that are comfortable to hold. There are several large and small zipped pockets at the front of the suitcases for your different needs. You can put the items like that you want to access easily at the airport at the front pocket and take out your ID, passport and boarding pass quickly at the airport. Each bag includes eight inline skate wheels that move smoothly and quietly in a vertical position without making any burden on your arm when you hold the telescoping handle. You can maneuver the bags quickly and effortlessly in small or tight spaces. You also have the option of lifting or carrying the bags by holding the side or top padded handles that are fairly comfortable. You’ll find the zippered pockets on the left to help you organize better and tight straps on the right to keep your clothes and other belongings in place. There is also a mesh pocket for you to put your smaller or delicate items in. You may certainly store these three bags fitted into each other to help save on space. You can use them for your leisure or business trips and pick one or two of them depending on how much you take with you and the length of your stay. You need to check in the 28 and 24-inch suitcases at the airport and take the 20-inch on the plane with you. You can fit it in the overhead locker bin above you. The 20-inch cabin bag weighs 8.6 pounds with the dimensions of 20 x 13.8 x 8.4 inches, the medium 24” weighs 10.5 pounds and measures 24 x 15.9 x 9.5 inches, and the large 28” suitcase weighs 12.7 pounds with the measurements of 28 x 17.8 x 10.6 inches. 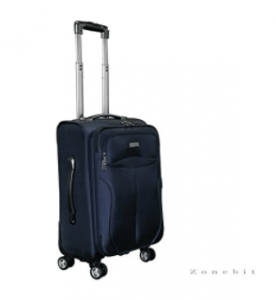 Please note that these suitcases are expandable by 25% to give you even more storage or packing capacity. The set offers decent value for money overall.